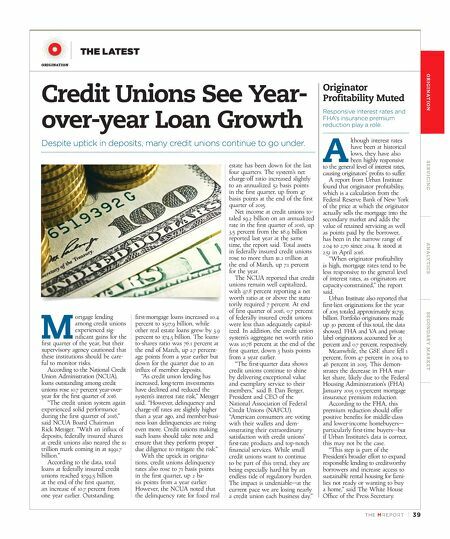 TH E M R EP O RT | 39 O R I G I NAT I O N S E R V I C I N G A NA LY T I C S S E C O N DA R Y M A R K E T ORIGINATION THE LATEST Credit Unions See Year- over-year Loan Growth Despite uptick in deposits, many credit unions continue to go under. M ortgage lending among credit unions experienced sig- nificant gains for the first quarter of the year, but their supervisory agency cautioned that these institutions should be care - ful to monitor risks. According to the National Credit Union Administration (NCUA), loans outstanding among credit unions rose 10.7 percent year-over- year for the first quarter of 2016. "The credit union system again experienced solid performance during the first quarter of 2016," said NCUA Board Chairman Rick Metsger. "With an influx of deposits, federally insured shares at credit unions also neared the $1 trillion mark coming in at $991.7 billion." According to the data, total loans at federally insured credit unions reached $799.5 billion at the end of the first quarter, an increase of 10.7 percent from one year earlier. Outstanding first-mortgage loans increased 10.4 percent to $327.9 billion, while other real estate loans grew by 3.9 percent to $74.3 billion. The loans- to-shares ratio was 76.1 percent at the end of March, up 2.7 percent - age points from a year earlier but down for the quarter due to an influx of member deposits. "As credit union lending has increased, long-term investments have declined and reduced the system's interest rate risk," Metsger said. "However, delinquency and charge-off rates are slightly higher than a year ago, and member-busi - ness loan delinquencies are rising even more. Credit unions making such loans should take note and ensure that they perform proper due diligence to mitigate the risk." With the uptick in origina - tions, credit unions delinquency rates also rose to 71 basis points in the first quarter, up 2 ba- sis points from a year earlier. However, the NCUA noted that the delinquency rate for fixed real estate has been down for the last four quarters. The system's net charge-off ratio increased slightly to an annualized 52 basis points in the first quarter, up from 47 basis points at the end of the first quarter of 2015. Net income at credit unions to - taled $9.2 billion on an annualized rate in the first quarter of 2016, up 3.5 percent from the $8.9 billion reported last year at the same time, the report said. Total assets in federally insured credit unions rose to more than $1.2 trillion at the end of March, up 7.1 percent for the year. The NCUA reported that credit unions remain well capitalized, with 97.8 percent reporting a net worth ratio at or above the statu - torily required 7 percent. At end of first quarter of 2016, 0.7 percent of federally insured credit unions were less than adequately capital - ized. In addition, the credit union system's aggregate net worth ratio was 10.78 percent at the end of the first quarter, down 3 basis points from a year earlier. "The first-quarter data shows credit unions continue to shine by delivering exceptional value and exemplary service to their members," said B. Dan Berger, President and CEO of the National Association of Federal Credit Unions (NAFCU). "American consumers are voting with their wallets and dem - onstrating their extraordinary satisfaction with credit unions' first-rate products and top-notch financial services. 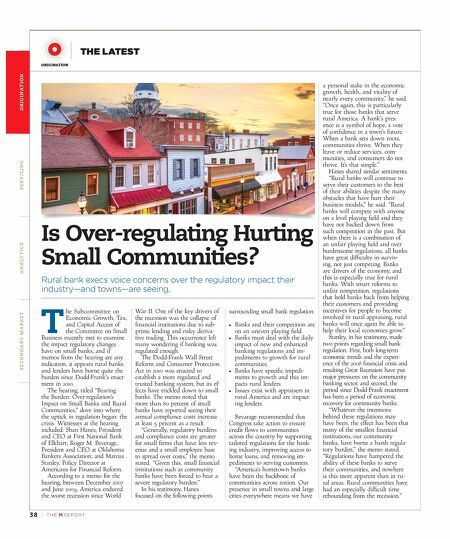 While small credit unions want to continue to be part of this trend, they are being especially hard-hit by an endless tide of regulatory burden. The impact is undeniable—at the current pace we are losing nearly a credit union each business day." Originator Profitability Muted Responsive interest rates and FHA's insurance premium reduction play a role. A lthough interest rates have been at historical lows, they have also been highly responsive to the general level of interest rates, causing originators' profits to suffer. A report from Urban Institute found that originator profitability, which is a calculation from the Federal Reserve Bank of New York of the price at which the originator actually sells the mortgage into the secondary market and adds the value of retained servicing as well as points paid by the borrower, has been in the narrow range of 2.04 to 2.70 since 2014. It stood at 2.51 in April 2016. "When originator profitability is high, mortgage rates tend to be less responsive to the general level of interest rates, as originators are capacity-constrained," the report said. Urban Institute also reported that first-lien originations for the year of 2015 totaled approximately $1.735 billion. Portfolio originations made up 30 percent of this total, the data showed. FHA and VA and private label originations accounted for 23 percent and 0.7 percent, respectively. Meanwhile, the GSE share fell 1 percent, from 47 percent in 2014 to 46 percent in 2015. This demon - strates the decrease in FHA mar- ket share, likely due to the Federal Housing Administration's (FHA) January 2015 0.5-percent mortgage insurance premium reduction. According to the FHA, this premium reduction should offer positive benefits for middle-class and lower-income homebuyers— particularly first-time buyers—but if Urban Institute's data is correct, this may not be the case. "This step is part of the President's broader effort to expand responsible lending to creditworthy borrowers and increase access to sustainable rental housing for fami - lies not ready or wanting to buy a home," said The White House Office of the Press Secretary.